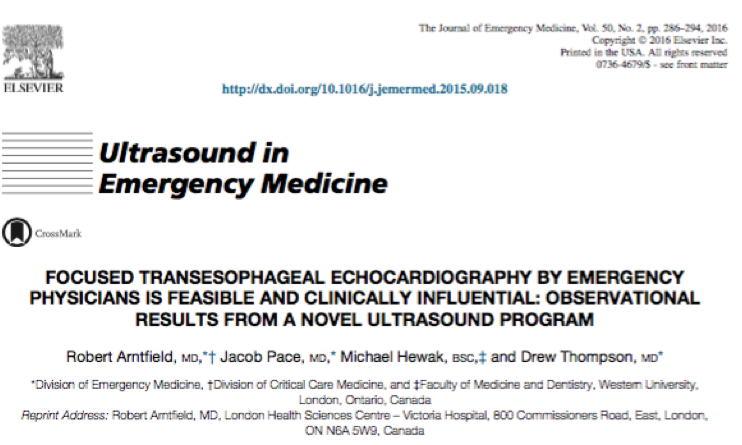 Several studies have demonstrated the feasibility to train emergency physicians and intensivists to use TEE at the point-of-care, and recognized its potential to enhance echocardiographic examination and improve decision making in critically ill patients, in the ICU and Emergency Department settings. In 2017, the American College of Emergency Physicians published a statement supporting the use of TEE in the Emergency Department. The following references are a selection of published literature relevant to the performance of resuscitative TEE. A weekly PubMed search will keep this section up-to-date. The first publication and arguably one of the most important papers, is this case series published in resuscitation in 2008 by Michael Blaivas. In this case series Dr. Blaivas reports the first experience of an emergency physician - performed TEEs using a focused protocol specifically in cardiac arrest patients. These cases were selected from among 15 TEE resuscitation cases occurring over a 6-month period at a large tertiary care emergency department. Building on the experience reported by Blaivas, several years later in 2015 Robert Artnfield and colleagues from Western University in London Ontario, Canada, reported their single center experience, conducting brief and focused TEE training on a group of 14 emergency physicians. In this study they report that following a 4-hour didactic and simulation based workshop, these physicians were able to adequately obtain and interpret TEE views and acceptable retention of this skill at 6 weeks. Of course, there are several limitations to this study, but it was the first report describing the feasibility to train providers in this focused protocol with a simulation based workshop. The third study, is the second publication from the same group published in the Journal of Emergency Medicine in 2016. This was a retrospective review of all ED TEE examinations carried out between 2013 and 2015 at their institution. The most common indications for TEE were intra-cardiac arrest care in 43%, post-arrest management in 26%, and undifferentiated hypotension in 40%. TEE imparted a diagnostic influence in 78% of cases and impacted therapeutic decisions in 67% of cases. The next study, was a brief report from the group at University of Utah. In this study they describe their group’s experience of first 12 cases of ECLS, (Extracorporeal Life Support) which involves placing selected patients on ECMO during cardiac arrest resuscitation as a bridge to immediate survival. This is relevant to those performing TEE in emergency medicine because TEE was an integral part of the cannulation process. In 10 of the 12 cases, emergency physicians performing TEE were able to confirm the location of venous and arterial guidewires before moving to dilation and cannulation phase. Many other centers performing ECMO in cardiac arrest are using TEE as integral part of their programs. Another simulation based prospective educational cohort conducted by a group at VCU in Richmond, Virginia. 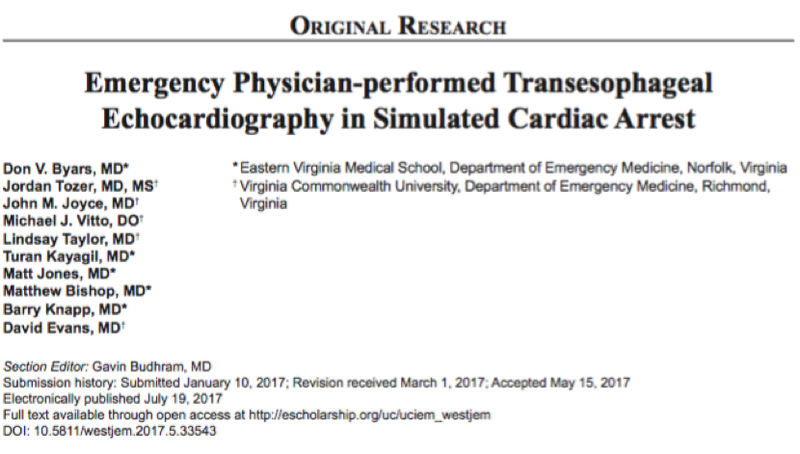 In this study, following a didactic lecture, 40 emergency medicine residents underwent 3 simulation based training sessions over the course of 3 consecutive weeks, followed by an individual simulation-based assessment to test the residents ability to develop and interpret both normal views, as well as some of the most common findings seen in cardiac arrest (such as tamponade, fine ventricular fibrillation or asystole). This study showed that EM residents can rapidly perform TEE studies in a simulated cardiac arrest environment with a high degree of precision and accuracy. 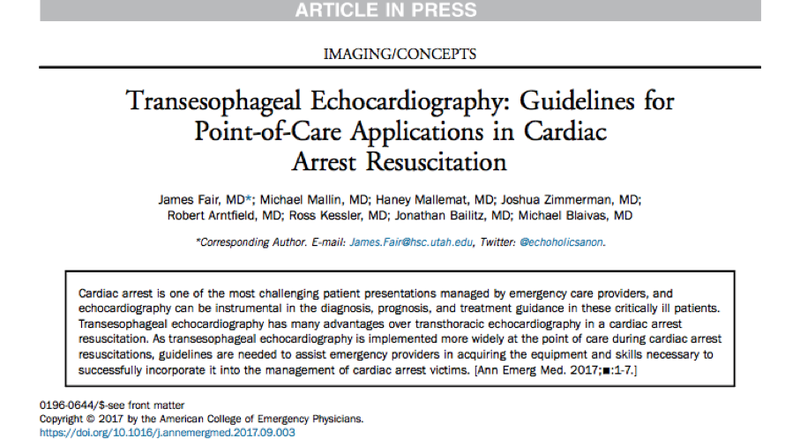 The American College of Emergency Physicians (ACEP) has recently published a Policy Statement titled Guidelines for the use of Transesophageal Echocardiography in the ED for Cardiac Arrest. In this guideline, the objectives and limitations for focused TEE in cardiac arrest are described, and general guidance is provided regarding qualifications and responsibilities of clinicians performing examinations, as well as documentation, equipment, safety and quality control.